This article first appeared in Options, The Edge Malaysia Weekly, on May 28, 2018 - June 03, 2018. Sitting on a hot bed of thermal waters, Hungary has perpetuated a spa culture for centuries. Kong Wai Yeng journeys to the city of spas, Budapest, to speak with Stephen and Margaret de Heinrich de Omorovicza on their namesake luxury beauty brand, which harnesses the healing powers of natural minerals from the ancient baths. 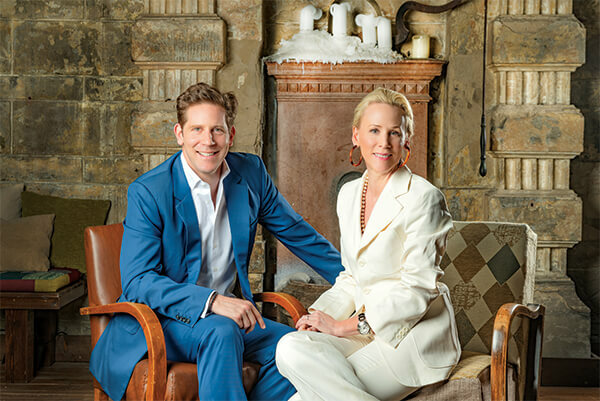 If a relationship in its ideal form should be a meeting of minds and hearts, the crackling chemistry between husband and wife Stephen and Margaret de Heinrich de Omorovicza embodies it perfectly. During our photo shoot at the Bohemian multicultural hub, Brody Studios, in Budapest, the couple prefers to either sit or stand together — in a clear declaration of their vision of romance and business partnership based on mutual respect and equality. “Neither of us is more important than the other. We are in this together,” Stephen assures me. The cult status of Omorovicza (pronounced “o-mor-o-veet-sa”) is built upon traditions and true serendipity; its success story a coincidence of fate, luck, hard work and Budapest’s rich lode of heritage. The Hungarian capital believes itself to be one of the places where the flame of Art Deco and Nouveau architecture burns the brightest; where its curative thermal bath sites — 125 in Budapest and almost 1,000 in the country — are as prized as the multitude of museums scattered across London or Paris. Teased by the promise of a rejuvenated body after a long flight, I took the plunge at the Neo-Baroque-style Széchenyi, the largest bath in Europe. For a calming 30 minutes, I briefly retired to a meditative state and disappeared into the magnitude of a 2,000-year-old ritual started by Roman emperor Marcus Aurelius. For the full story, pick up a copy of The Edge Malaysia (May 28) at your nearest newsstands or visit optionstheedge.com.